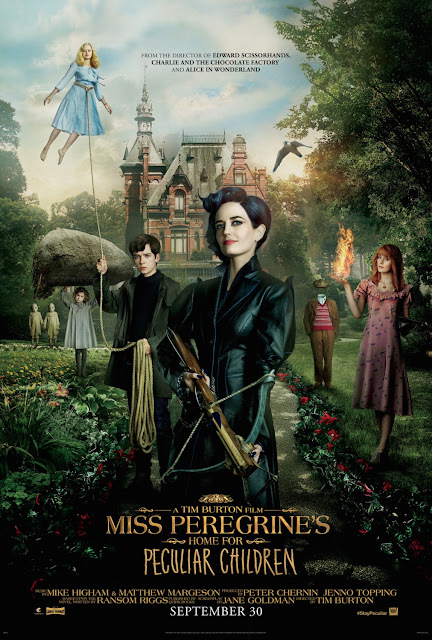 Chrichton's World: Review Miss Peregrine's Home for Peculiar Children (2016): I liked it but it was a little underwhelming! Review Miss Peregrine's Home for Peculiar Children (2016): I liked it but it was a little underwhelming! First off, I never read the book so I won't be able to compare it to the book and often that is more a blessing than disadvantage since that allows me to judge to film on it's own merit. So let me put it out there that this without a doubt is one of Tim Burton's best he has made lately. That being said it still is not as good as his masterpieces like Beetlejuice, Edward Scissorhands and Big Fish. For that Miss Pergrine's Home for Peculiar Children is lacking a little. To me it felt like they rushed through the story and characterization so much that they skipped very essential parts that would have enabled me to relate to the main characters more. They were likable but just barely. There is not much depth to them and other than a few displays of the peculiarities and how that is perceived by the general public there is not much more to it. And yes the comparison to X-Men is very easy to make since there are many similarities. However Miss Pergerine's is much slower and lower on action which doesn't automatically make it worse. On the contrary. But why does it have to take so long for the adventure parts to occur if you are not going deeper into the characters or story anyway? Too much time is wasted on main character Jake (Asa Butterfield) and how he is pivotal for the future of the peculiar children. This promise is never delivered on in a way that I found entirely satisfying. Especially if you find out about one of the elements that is supposed to make him special. I was like, that is what makes him special? Seriously? Still when events finally start happening the film does make up for some of the flaws especially one big action scene towards the finale that stands out because of some surprises and a wonderful dance track. The performances overall are adequate but the most interesting characters don't get the screen time they deserve. Eva Green (Miss Peregrine) was really excellent and yet she was barely in it. Little peculiar for a character whose name is in the title don't you think? Asa Butterfield is decent I guess but to be honest I found him very boring overall. He did not bring enough to make his character more exciting or interesting. He constantly looked like he did not belong. Even at the end. I have no doubt that the intentions were good and that the film is enjoyable but I was expecting more. Mrs. P. for example had less reservations and loved the film as it was. The film will not feel like it's a waste of time but it also never reaches heights that will stun you with amazement. And with a premise of such fantastical elements that should be a requirement. Or am I being too critical?So for once I will leave it to the reader what to make of this.